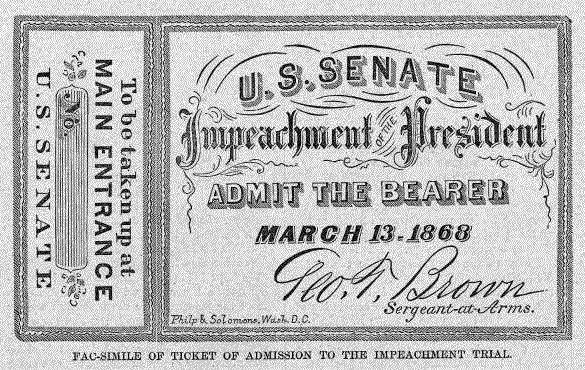 President Johnson’s Impeachment trial began #OnThisDay March 13, 1868. On May 16 the U.S. Senate failed to convict him by one vote. They voted again on May 26, 1868, with the same result. I don’t want to dwell on the details of President Johnson’s trial, but on the Constitutional Provision itself. The Constitutional provision of impeachment for public officers was copied from an English practice. The House of Commons used that power against King’s ministers. By the 1700s, a law was enacted which denied royal pardon in cases of impeachment. This assured that the King’s ministers would be held accountable for their actions. However, none of this legal accountability applied to the King himself, he couldn’t be impeached. If you wanted the king gone, your only option was violence, revolution! James Iredell gives the background of this provision when speaking to the North Carolina Ratifying Convention in 1788. This provision assures that the President and other officers are responsible to the House of Representatives, that is, to the people. Instead of violent overthrow, the people, through their reps, can hold their President accountable for his actions. Two-thirds vote is required to convict. The two-thirds requirement protects the accused from a mere party motivated indictment. For instance, history seems to prove that Andrew Johnson was impeached on solely party lines, and though most voted to convict, they were still one vote shy. So the provision appears to have worked in that case. America is a Government of laws and not of men. The American tradition teaches that nobody is above the law. We have every right to be proud of our system of government which set an example for the world. Our leaders are accountable to the people and we enjoy peaceful transfers of power. That’s a portion of our heritage to be proud of!